Prominent & Leading Manufacturer from Delhi, we offer ultimate premium plus exterior emulsion, mava premium exterior emulsion, magma exterior acrylic emulsion, weather proof emulsion and x- gaurd exterior emulsion paints. 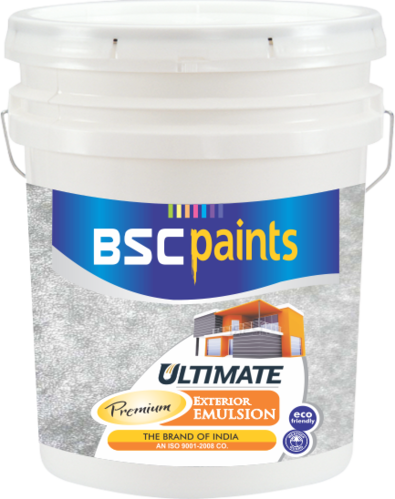 BSC Ultimate contains high sheen that will make your walls sparkle. This adds elegance to your home and ensures that it make heads turn and earns praises. It also contains UV resistant color pigments to ensure cleaner and brighter shades. Ultimate advanced anti-algal bio pack prevents the formation of algae and keeps ugly black spots away. It is most advanced exterior painting system that gives your home ultimate protection along with unmatched beauty. Ultimate introduces 7 years performance warranty that covers product performance againt fading, flaking, peeling, algae growth, and fungal growth as well. 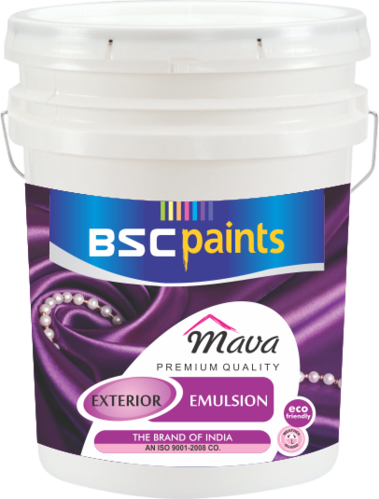 We are willingly offering a wide collection of Premium Exterior Emulsion. Provide fresh looks & excellent protection to all exterior surfaces, the offered emulsions are well processed in our advance processing unit by using finest quality ingredients and leading technology according to the set market standards. Our quality controllers test these emulsions on numerous quality parameters so as to deliver a flawless range. 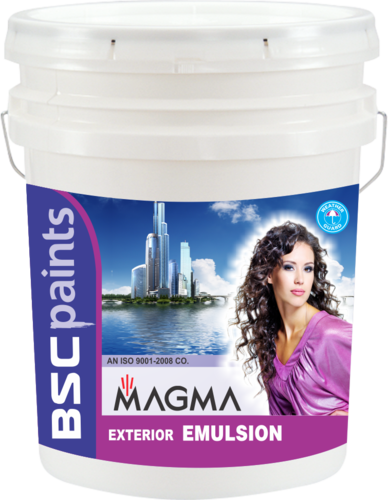 We hold expertise in offering a wide array of Magma Exterior Acrylic Emulsion. In comparison to cement paint, this provides resistance to cracking and weathering, the offered emulsion is perfectly processed with premium quality chemicals in adherence to market standards. Not only this, the offered emulsion is packed with high precision to assure its purity for a longer period. BSC paints Ultra Advanced Anti Algal Weather Proof Emulsion is a water-based, modified acrylic, anti algal, high performance exterior wall finish. Its revolutionary formulation provides long-lasting exterior performance even in the most extreme tropical conditions of India. It’s unique advanced anti algal chemistry ensures that exterior walls are provided with power-packed resistance against algae and fungi growth. It has very good dirt pick up resistance and dirt cleaning properties that give your exteriors a lasting beauty and extreme protection.